It’s sad how awful most of those systems look, imo. The HTs win out hands down, imo. I am completely dumbfounded as to how these in the public eye, extremely wealthy people actually dont have the money to repair their vision or at least purchase a mirror!!! I mean with all the technology out there for HT’s WHY??? And if you are to wear a piece which is your personal choice (and in some cases maybe the only choice), why not a good one like John Travoltas, or even Jeremy Piven. For years I didnt realize anything…It seems like Mr. Travolta is slipping much more now, or maybe he just doesnt care, who knows. I wonder who did this one for him, it looks believable. Wonder what something of that level of quality would cost? I don’t think the best looking ones necessarily have to cost a ton more than average. But a lot of the success is in the handling of it all. Matching the piece to the guy’s existing hair, cutting them both to blend right, applying it well, keeping it clean, etc. A very high quality 'piece will still look like crap if any of those factors are off. What would it look like in person face-to-face? What about swimming, showering, wind, etc.? » I wonder who did this one for him, it looks believable. is it toupee? 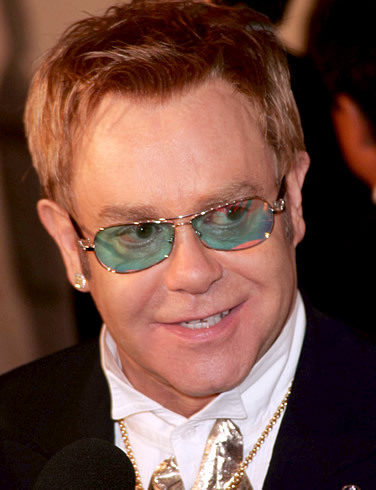 i have read some articles and thought all the time that Elton has he’s own hair now.